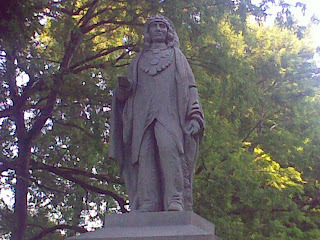 at the Menominee statue In Plymouth IN. It is Actually so sad what happened. This web site has nothing to do with Indiana, but has much wisdom with in the contents. Did you know that the person who built the first race track for the Indy 500 also developed Miami Florida from a marsh swamp to what it is today? History of Carl Fisher developer of Indy 500, Miami Florida, and many many other prodjects. 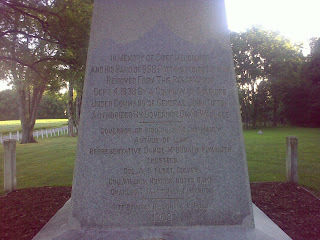 FrancisVille Indiana is a large lime stone area. I drive past this area every month and started to research this natural product. Did you know that Indiana Limestone is the most sought out lime stone in the world. Lime stone is actually made from a vast body of water over millions of years. Yes, Indiana at one time was a vast Ocean. Like many people I have driven by a sign on by pass 20 on the south side of South Bend Indiana, saying this is the Continental Divide. For many years I thought so what, finally I read about it and would like to share what I found. You can also find a lot more by searching Continental Divide. 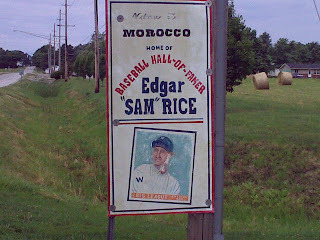 Moraco a small town in Indiana had a great person by the name of Edgar Sam Rice. You can read more about Mr. rice by going to the web site. ....is a beautiful state. Sometimes you have to sit back and look at the simplicity of things to be able to appreciate the beauty around you. 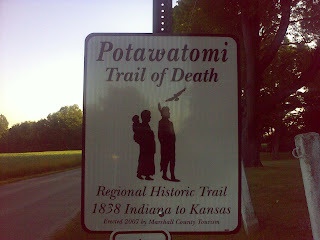 This blog is my dad's idea and with his job he travels across much of the northern area of Indiana. He wanted a way to "catalog" those moments that he sees the beauty in his day.